Dectin-1 is a 33 kDa type-2 transmembrane protein that is a member of the Group V non-classical C-type lectins. It is also known as the beta-glucan receptor (ßGR) and the C-type lectin domain family 7, member A (CLEC7A). Functioning as part of the innate immune response to defend against fungal attack, Dectin-1 is expressed on mouse and human immune system cells. Structurally, Dectin-1 contains a C-terminal C-type lectin-like domain (CTLD) followed by a short stalk joining the transmembrane region to the cytoplasmic tail, which contains an ITAM like motif. Two different isoforms of Dectin-1 are expressed (ßGR-A and ßGR-B), one full-length and the other lacking the stalk region. Dectin-1 binds beta-glucans, glucose polymers that form cell-wall components or exopolymers of fungal pathogens such as saccharomyces, candida, pneumocystis, and aspergillus. Therefore, it plays an essential role in the innate immune defense system. It is able to mount TLR-dependent (using TLR2, TLR4, TLR5, TLR7, and TLR9) and immune independent responses, leading to phagocytosis, and the induction of cytokines and chemokines. In the mouse, Dectin-1 is expressed on dendritic cells, monocytes, macrophages, neutrophils, and some splenic T cells. 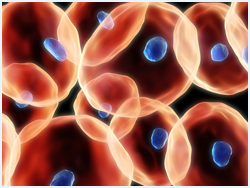 In humans, it is also found on mast cells, eosinophils, and B cells. Dectin-1 has been separately described to associate with CD37 as well as CD63. Rat anti-mouse Dectin-1 (MCA2289, clone 2A11) antibody is available purified, and in a low endotoxin formulation for functional studies, such as for inhibiting the binding of zymosan to macrophages. These formats are also performance guaranteed for immunoprecipitation, Western blotting, and immunohistochemistry on frozen sections. MCA2289 is also available conjugated to AlexaFluor® 647, Biotin, FITC, and RPE for use in flow cytometry. Many of our Dectin-1 antibodies can be ordered in small vial sizes (i.e. 25 Tests/25 µg) for testing. Mouse anti-human Dectin-1 is available from two different clones: (MCA4661, clone GE2), which recognizes both isoforms of Dectin-1, and (MCA4662, clone BD6), which recognizes ßGR-A alone. Anti-Dectin-1 antibodies from both clones are available purified and conjugated to FITC for flow cytometry. Clone GE2 is also available in an endotoxin low formulation for functional studies. Both antibodies can also be ordered in small vials sizes (i.e. 25 Tests/25 µg). Brown, G. D. et al. (2002) Dectin-1 is a major beta-glucan receptor on macrophages. Taylor, P. R. et al. (2002) The beta-glucan receptor, Dectin-1, is predominantly expressed on the surface of cells of the monocyte/macrophage and neutrophil lineages. Reid, D.M. et al. (2004) Expression of the beta-glucan receptor, Dectin-1, on murine leukocytes in situ correlates with its function in pathogen recognition and reveals potential roles in leukocyte interactions. Willment J.A. et al. (2005) The human beta-glucan receptor is widely expressed and functionally equivalent to murine Dectin-1 on primary cells. Eur. J. Immunol. 35: 1539-1547. Heinsbroek S.E. et al. 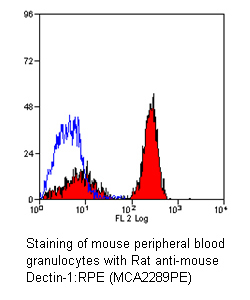 (2006) Expression of functionally different Dectin-1 isoforms by murine macrophages. Taylor, P. R. et al. (2007) Dectin-1 is required for b-glucan recognition and control of fungal infection.